Summary: ​Ladder Life is ​an excellent option for purchasing large amounts of insurance fast with the ​opportunity to change coverage as your life changes. However, ​they don't seem to offer any additional policy riders, ​and don't do a great job at explaining the process with video. This is why I put this Ladder Life Insurance Review together. To help you see how simple and fast ​Ladder Life makes it for you to apply for life insurance online and ​allows you to customize your coverage as your needs change. Enjoy ! *Rates based on an 20 year old female buying a 10 Year $100,000 term policy, she is in excellent health and a non-tobacco user. ​Who Is ​Ladder Life Insurance? Is It Really A 5 Minute Decision? Ladder Life's Rates: How Do They Compare? In the age of Amazon and Baidu, everything is going online, and life insurance is just now catching up. ​With everything I know about term life insurance​, it still took me 3 weeks to get ​a life insurance approval decision when I decided to get a few quotes and get covered. During those 3 weeks, I had to go pick up my ​medical records and ​continuously follow up with the underwriter. 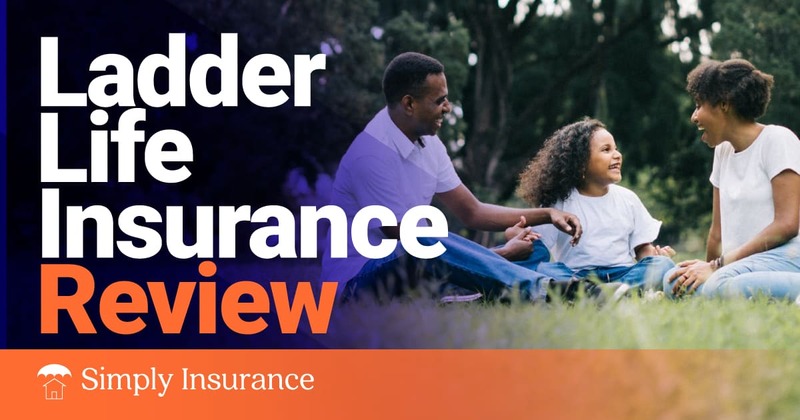 In this review today, I am going to show you how ​Ladder Life​'s Laddering process works, and why it's one of the best ways to buy term life insurance online. ​Ladder Life Insurance is a digital insurance agency ​who has partnered with Fidelity Security Life Insurance Company & Hannover Re. ​Fidelity Security Life has been around since ​1969 and has an A.M. Best Rating of (A- Excellent), and all of the policies are reinsured and backed by Hannover Re who has an A.M. Best Rating of A+ (Superior). This is an important factor because when it comes to life insurance, you need to know that you can rely on an insurance company and that they are financially sound. *Disclosure - ​Ladder has partnered with Fidelity Security Life Insurance Company, which has been rated A- (Excellent), based on an analysis of financial position and operating performance by A.M. Best Company, an independent analyst of the insurance industry. All Ladder policies are reinsured by Hannover Life Reassurance Company of America, which has ratings from Standard & Poor's AA- (Very Strong) and A.M. Best A+ (Superior). What Makes Ladder Life Different? Ladder Life is one of the first companies that offer the ability to apply for term life insurance up to $8,000,000 entirely online and without the need to consult an agent. They have also created a process they call Laddering ​which allows a customer to either Ladder Up their coverage or Ladder Down their coverage. ​Ladder Life is taking the life insurance and turning it on its head. ​They have created a process they like to call Dynamic Life Insurance. 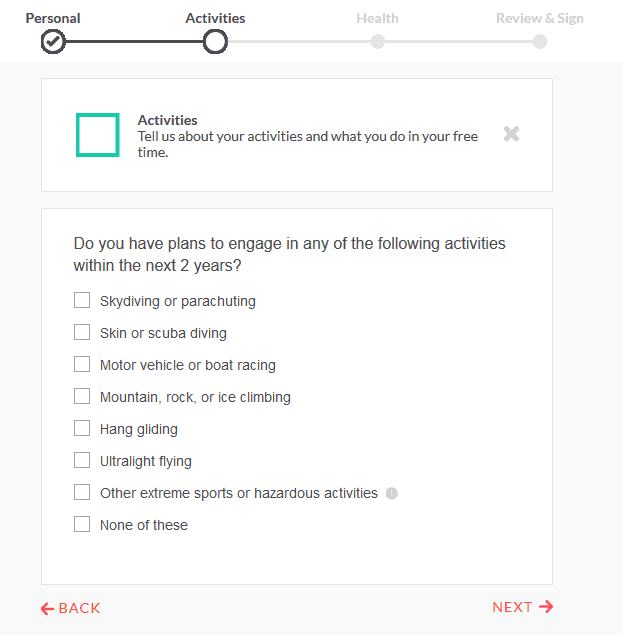 ​Ladder has streamlined your ability to change your life insurance coverage based ​on your current life events. ​Once your initial coverage is in place, you can either "Ladder Up" or your coverage or "Ladder Down" your coverage. ​Life changing events are the number one reason that people will need to make changes to their insurance plan. This is very true when it comes to Laddering up your coverage. ​Let's say you started with $100,000 in life insurance for $18.00/month. You get married, and now all of a sudden $100,000 isn't enough coverage. With Ladder Life, you get a quote for let's say an additional $150,000 in coverage for an additional $11.00/month. Ladder would quote you what the additional premium would be, get your exam completed if one is needed, and your policy would change from $100,000 in coverage to $250,000 in coverage​. ​Your new premium would be $29.00/month, and you would have $250,000 in coverage. The reason this is awesome is ​that most companies would require you to cancel your previous policy and start all over from the beginning. If you were to have a baby or purchase a new home, you ​start to get the picture of how many times you might need to add more coverage. Ladder Life Makes it a smooth transition. ​Let's Keep ​the same example from above. However, let's say things are going in reverse. Your ​nest egg is growing, you are paying down your mortgage, and your kids are getting older. Ladder Life is going to give us the option to be able to cut ​your costs tremendously by allowing us to Ladder Down your coverage for savings, all ​at no ​charge. ​The way it works is that your ​payments will decrease ​by the same percentage as your coverage does. If you decrease your coverage by 10%, your premiums will decrease by 10%. You can do this on a monthly basis. 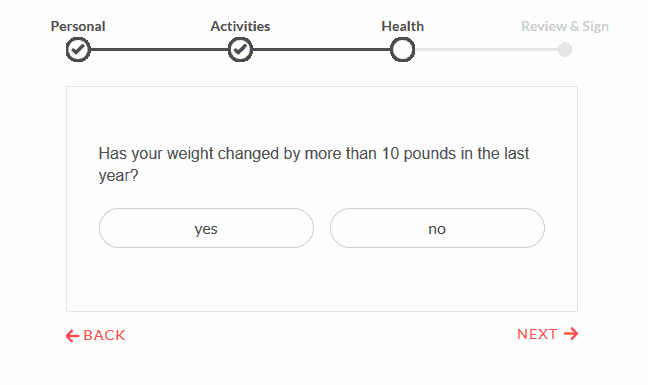 ​If you use this option, just think about the savings. If you ​end up with $2,000,000 in coverage for let's say $100.00/month and decide to decrease your coverage by 8%/month. ​Based on the chart below, in the first year alone you would have saved $62.32/month. Without making any additional changes that's a saving of $13,564 over 30 Years. You also would still have around $735,000.00 in life insurance remaining. 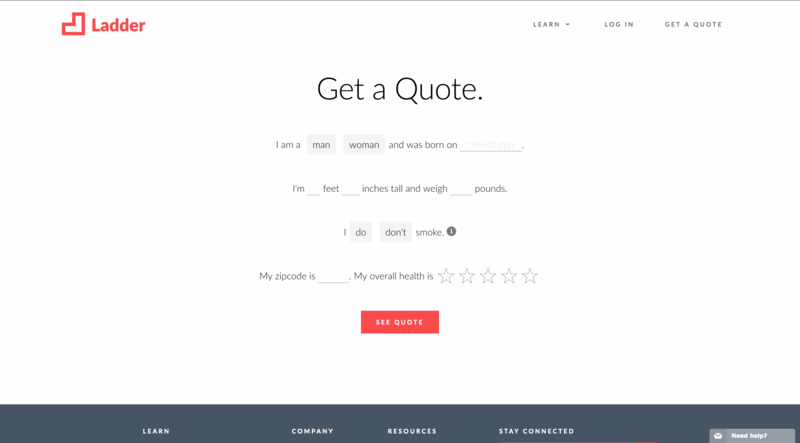 GET YOUR FREE LADDER LIFE QUOTE TODAY! Ladder takes a bit of a different approach ​to their application. They ​do a complete verification of your personal information on the front end; I prefer this method. ​Unlike other carriers, at this point in the application, they ask about tobacco use in the last ​three years or marijuana ​during the previous 12 months. 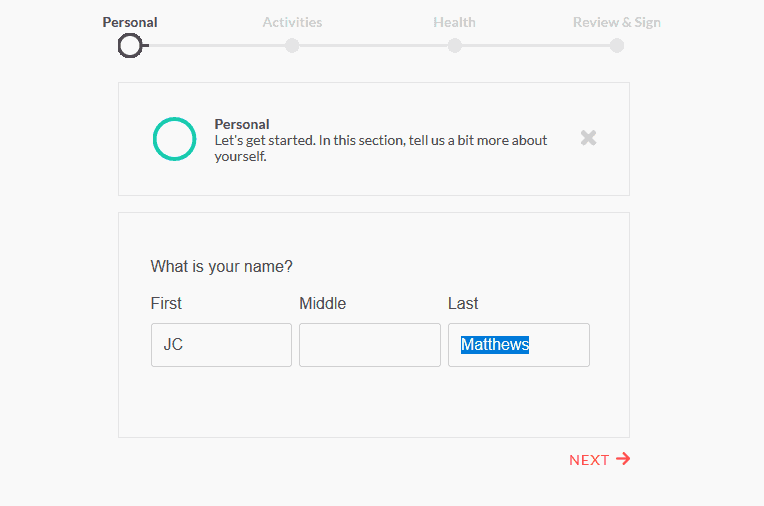 After you knock out your health questions, you are sent to the section to review and sign your application. I can honestly say that if you know all of your personal information like your social, drivers license and primary doctor's information then yes; you are easily looking at around 5 minutes for a decision. 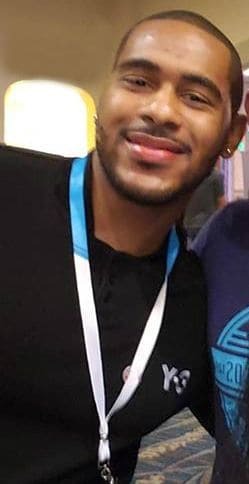 Ladder Life Insurance has really created a great option here by offering up to 8 Million Dollars in life insurance coverage. 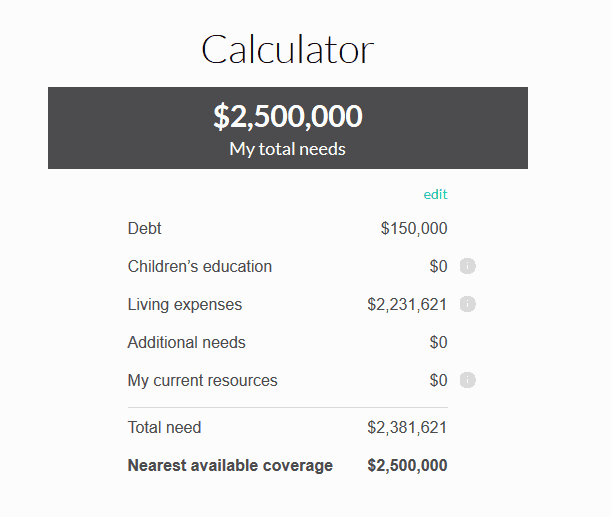 To some, it might seem like a bit extreme; however, it's all about annual income, and some people need this amount of coverage. 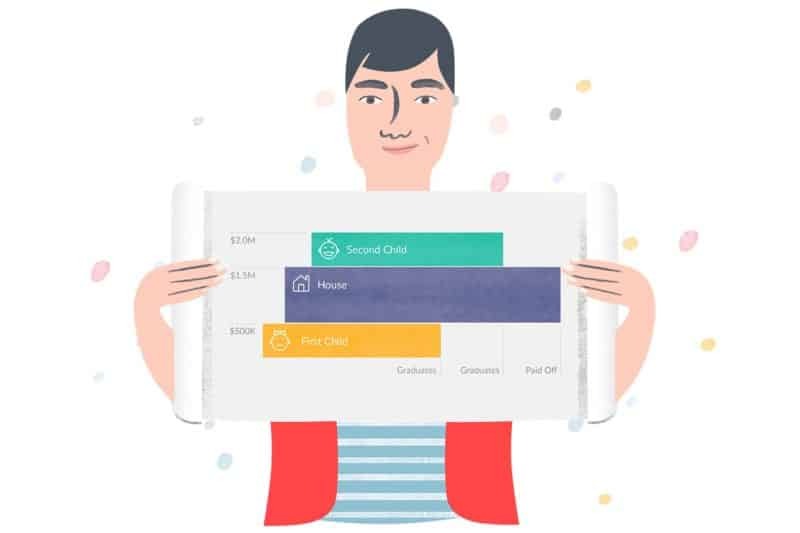 The reason I am excited by this is ​that Ladder Life is going to eventually be able to replace the long process of financial underwriting with better and faster technology. Also, this is the MOST any insurance carrier is offering ​in a consumer-facing product. If you need more than $1,000,000 in life insurance, then Ladder Life is definitely the place you should start. 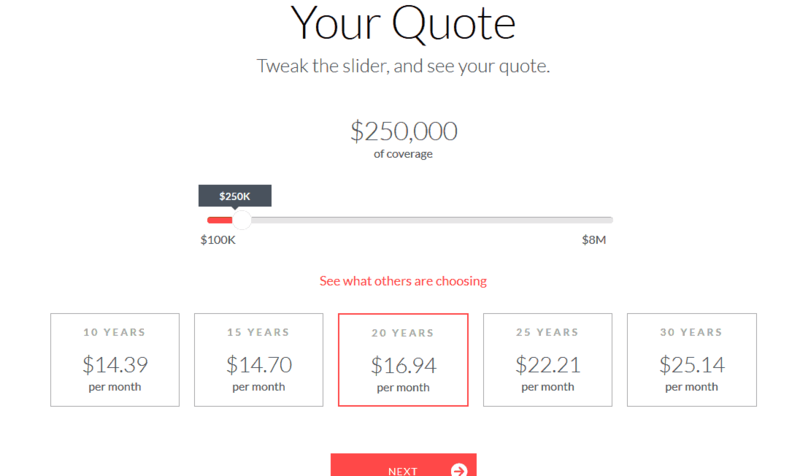 ​Ladder Life's monthly rates are based on a male wanting $250,000 in coverage for 20 years. ​10, 15, 20, 25, & 30 Year Term Options Available. Ladder Life Is Currently Expanding Nationwide. 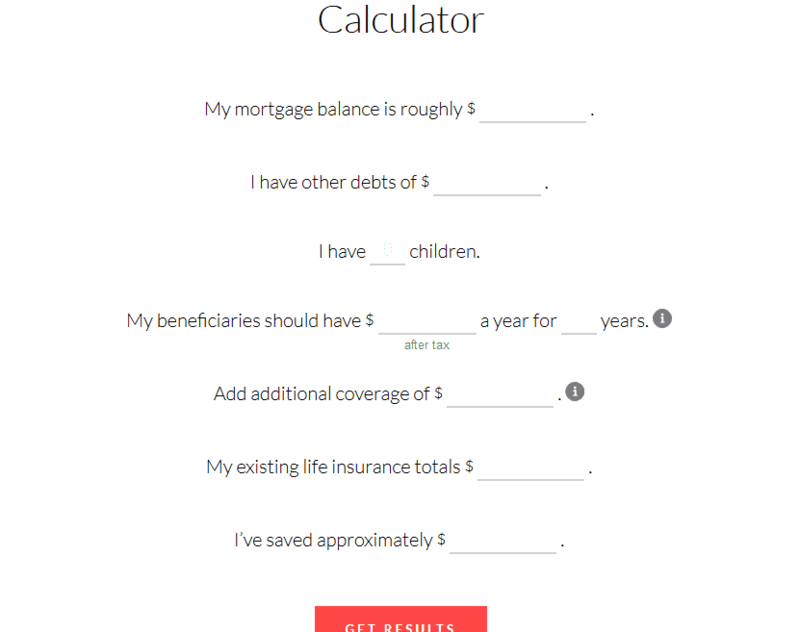 Ladder Life Insurance has a pretty nifty Life Insurance ﻿Calculator ﻿tool. Think of it ​as a 30 Day Guarantee. If you decide against the policy within that 30-day window, you ​can cancel it and receive a full refund. I know my Ladder Life insurance review is one of the longer ones out there. However, I wanted to make sure that I gave as much detail as possible. If you have been holding off on buying life insurance for any reason, I say give the 30-day free look period a shot. *Disclosure - Ladder has partnered with Fidelity Security Life Insurance Company, which has been rated A- (Excellent), based on an analysis of financial position and operating performance by A.M. Best Company, an independent analyst of the insurance industry. All Ladder policies are reinsured by Hannover Life Reassurance Company of America, which has ratings from Standard & Poor's AA- (Very Strong) and A.M. Best A+ (Superior).